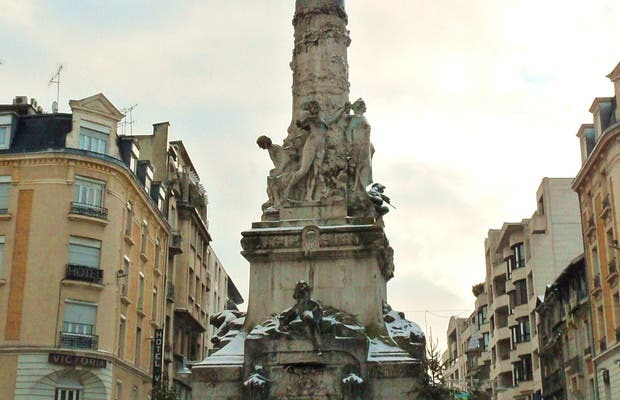 Situated in the heart of the city of Reims you can find the Drouet d'Erlon's Square which, besides being one of the busiest square around, has at its center a beautiful fountain topped by a golden statue called: "The Glory". While I was wandering through the old town in search of the cathedral, a golden glow dazzled me and I felt obliged to stop and see what it was. The fountain and statue of the Angel are both beautiful. Despite being a Sunday, it was practically empty. Now, everything is covered by a layer of snow around the square and there are also a large number of decorated posts. I discover another painful story about World War II, since apparently this area was completely destroyed by bombing.